Coconut oil is taking the cooking and healthy care market by storm and with good reason as it boasts numerous healthy benefits. I was slow to warm up to the idea of using coconut oil, but as soon as I was contacted by Organika and asked to review their award winning Organic Virgin Coconut Oil, I was more than happy to give coconut oil a try. It has antimicrobial, antioxidant, antifungal and antibacterial properties to help heal numerous ailments. Coconut oil can be used in cooking as a substitute for butter, margarine, shortening and vegetable oils and can be substituted with the same amount as called for. It can be used in its solid form or can be melted on the stove to use in its liquid form. I took a small shortcut and placed the cup of coconut oil on the stovetop which the oven was preheating and had melted coconut oil within a few minutes. 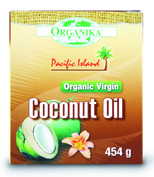 I loved how easy it was to make the substitution and was very impressed by the texture of Organika's Coconut Oil. 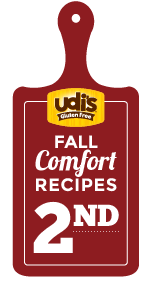 I enjoyed how it created a velvety batter and produced a very fresh and delicious muffin. I look forward to my many more adventures with this new product. Also check out the Organika website for a full list of all the organic and health related products they offer and where these items can be purchased. They were also kind enough to send me a bottle of their Coconut Aminos, so more great recipes to follow next week! Combine wet ingredients in a bowl, except for mango. Add wet ingredients to the dry mix and mix to incorporate. Fold in diced mango. Pour into greased muffins tins and bake for 18-20 minutes for mini muffins and 22-25 for larger muffins. Enjoy! Did you use the coconut oil in solid form? Or did you melt it down first? Thank you for the question! Melt it first.